Great to see this car getting another bite of the cherry of life. I remember it having some very nice fabrication and welding being done - in particular I seem to remember the base of the windscreen being repaired nicely - that has to be a big bonus. Yes indeed Alan and the chassis legs. It used to be other folks' children that made me ask where the years have gone, now it's other folks' restoration projects!!! The welding that has been done is very neat indeed. I think that the footwells will be the worst bit now. We're already 4 pages in and Mart hasn't even got the car yet! And it isn't even a 1300FWD, pah. I can't wait to see work start on this one...! Hard to resist another Sprint was it eh...?!?!?! One marriage, one house move, two kids and a cardiac arrest (I kid you not!) later and I finally have to admit defeat on the red sprint. There was no way I was going to break it and after the failed joint venture due to logistical and storage issues the only sensible thing to ensure the long term future of the car was to search out the mad one known as Mart!! It is all packed up in various boxes for Marts attention, just awaiting collection. The parts are either good, bad or ugly but knowing and trusting Mart, all will turn out well. As far as I remember the Pimento colour is original and the correct code on the plate. The spec is early late model if that makes sense. I.e double lamp rear bumper and round hazard switch on single line brakes and no waxstats. I've not checked recently if the photos are still hosted but there are masses of pics about. 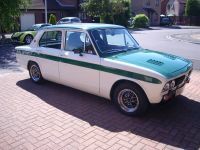 The green sprint is still on the driveway, insured and is started every few weeks. It will be going to a local garage for two cills and a rear arch next year. Guess the real question is which one will be on the road first?! Welcome back Colin. This could be a close run thing. The reason I remembered the plate is because *JX is a Halifax registration (as was *CP on my Dolomite 1300). Have you received 'XJX' yet Mart...?! Ooooh, bit of a sore point there GK. Transport still, errr..... pending (no fault of Marts though it needs to be said). Well the paint stripper has arrived (I don't mean Mary). Finally we have some movement. XJX should be in sunny Weston tomorrow lunchtime. Finally!?! FFS Mart, some of us have projects on the go that are into their second decade. A few days does not warrant 'finally'.